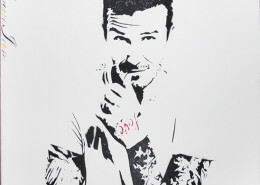 Bambi is a British street artist that has presented numerous works throughout the city of London. Keeping her identity anonymous, she portrays current culture through her unique style, and has received wide recognition for her public murals of such figures as Prince William and Kate Middleton, and a full portrait of Amy Winehouse that is now protected by plastic. Inspired by a cross of artists including Bansky, Bambi addresses controversial subject matter that is accessible to a range of viewers. Bambi describes her work as, “I let my work speak for itself. But dreams can inspire me and I am particularly interested in people who spread love and joy…” Bambi studied at St. Martin’s Art College and she continues to live and work in London. Portrayed by some already as ‘the female Banksy!’ The up-n-coming artist known as Bambi, has set off to a great start in the commercial Urban art market.